I can't even believe it has been 9 months already. My little guy is growing up ... Cooper is growing faster than I can keep up with. I seriously don't remember Shelby's first year going by so fast. 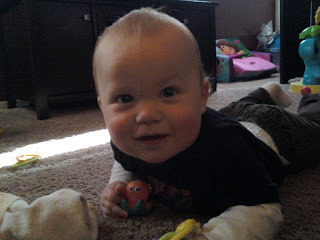 Coop is now doing a modified version of crawling ... dragging his body around the room. He will crawl for things he's not suppose to have, like a remote control or a cell phone, but he won't crawl for toys (who wants a ball when you can have a cell phone?). He's slowed down in the weight department, but is shot up in height (adding about 5 inches in just the last 3 months!). He's my little tank! He eats just about everything in sight. I think we're up to four jars of baby food a day along with four to five 8 ounces bottles. The only thing Coop won't eat are peas. He hates them. It's pretty funny to see his reaction when you try to give them to him. He gags and acts like he's dying. It's hilarious. 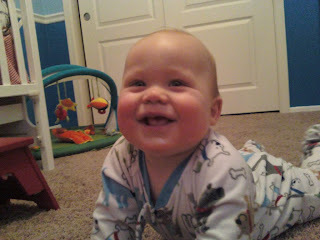 Coop is still as jolly as ever, though he is starting to have an opinion about things. If you take a toy away from him, then he'll scream bloody murder. Of, if you get in his way when he's trying to watch something on TV or see his sister dance for him ... there will be heck to pay! Cooper and Shelby are still the best of friends. If later in life they love each other even a fraction of how much they do now, I'll be thrilled. She can make him belly laugh with a single look and calm his tears with a silly dance and a kiss. She loves him like no other and the feeling is mutual. As their mama, I am beyond happy when I see them together. They were made for each other. 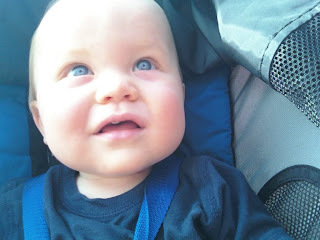 Some days I think Cooper looks just like a DeMucha. Other days he's all Kalil. Some days I just don't know. No matter what, he's adorable. I love this guy. This is Cooper playing in a box. Shelby took an old box and made a little house out of it. 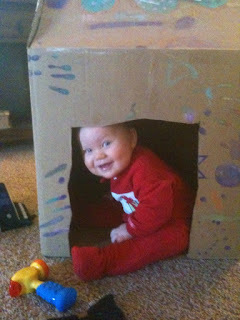 We cut out a door and then she painted on the outside of the box, as well as the inside. She has toys in there, a pillow and even a little blanket. She LOVES to play in there and invited Coop to join her.